Australian designer of sailing multihulls. 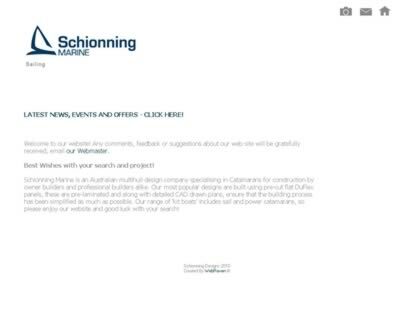 "The basics are seaworthiness, bridgedeck height, buoyancy distribution, structural strength, ability to sail out of an unpleasant situation, and seakindliness to keep the crew comfortable and competent"
Web Site Snapshot: If available, above is a snapshot of the Jeff Schionning Designs web site at http://www.schionningdesigns.com.au/ as it appeared when this site was added to the directory or last verified. Please Note that Boat Design Net has no involvement with the above web site; all content and images depicted in the above thumbnail are the property and copyright of Jeff Schionning Designs unless otherwise noted on that site. Description: Australian designer of sailing multihulls. "The basics are seaworthiness, bridgedeck height, buoyancy distribution, structural strength, ability to sail out of an unpleasant situation, and seakindliness to keep the crew comfortable and competent"